Our comprehensive guide answers every boot care and cleaning question you didn't know you had. Cleaning and caring for your boots can make all the difference to the lifespan you get from them. 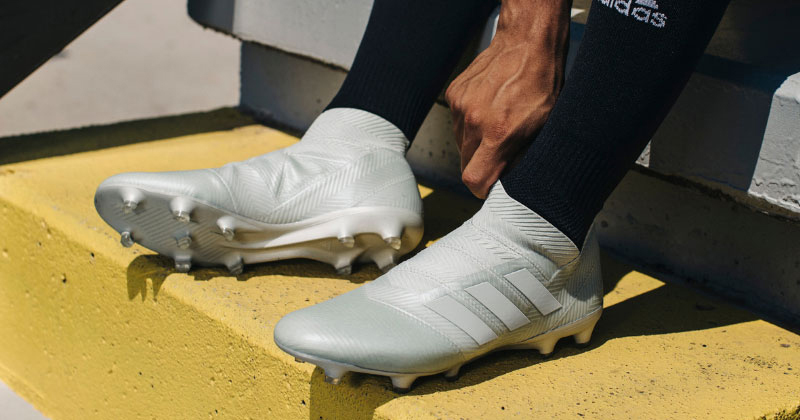 A bit of time and care invested after each wear can save you ££'s in the long run so we've pulled together a few of the key football care and cleaning FAQs into this handy guide. How tight should football boots be? We’ve all been there, you try on a pair of new boots and they feel great in the shop. Then, wear them on the pitch for 10 minutes and your feet are throbbing and by the end of the game your toenails are black. It’s too late to return them so there’s only one answer: let’s get stretching. Here are the FOOTY.COM tips on how to stretch football boots in a desperate situation. You can stretch boots by up to half an inch by using traditional shoe stretchers like these. Shoe stretchers (and in fact any stretching technique) work best on leather boots but can also give extra room in synthetic boots too, but you’ll need to repeat regularly to maintain the extra room. Two-way shoe stretchers will give you extra width or length or both if that’s what you need. Use a shoe stretch spray to prepare your boots, focus your spray on the areas that are pinching the most. Insert the shoe stretcher into the boot, making sure that the toe block touches the end of the toe box and the heel is securely placed inside the boot. Rotate the lengthening/widening wheel until the shoe stretcher is taut lengthways and/or widthways. Wait for 6-8 hours and check the fit of the boot. If it is still tight, repeat the process. Fill a water-tight bag with water. 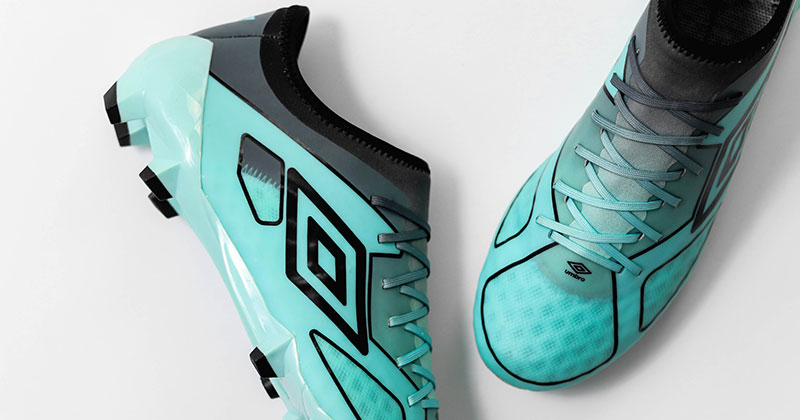 Insert the bag carefully into the toe of your football boot. Place the boot into the freezer for around 8 hours. The frozen water will expand and stretch your boots. Repeat if necessary until you get the desired fit but do be aware that repeated exposure to freezing temperatures could damage your boots. 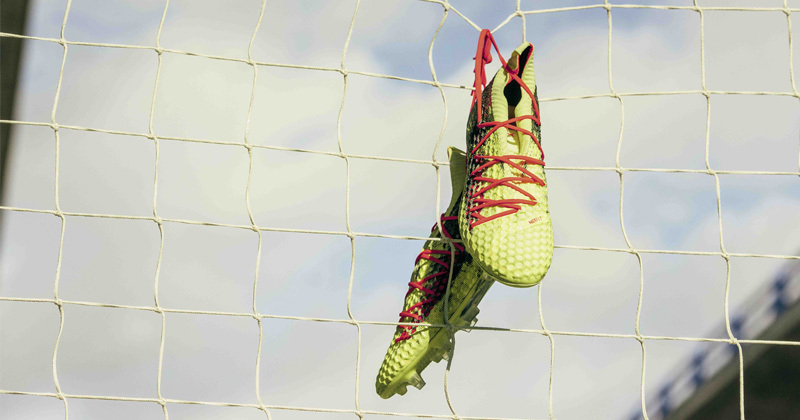 Place your boots onto your feet and secure the laces. Take a warm, damp cloth and carefully wet the entire outside of the boot. Wear the boots for a training session, the movement of your foot inside the damp boots should ease the pinch. Repeat until you get the desired fit. Put on two pairs of football socks and your boots. Sit in the bath with your boots on for around 30 minutes. Get out of the bath and remove the boots. Stuff them with newspaper and allow them to dry naturally. Replace the newspaper every few hours to speed up the process. Using a clothes steamer or steam cleaner. Carefully using the steam feature on an iron. Elevating the boots above a steaming hot bucket of water. However you produce the steam, you should aim to steam the boots for around 30 minutes and ensure that they are steamed both inside and outside if possible. You should then place the boots onto your feet as quickly as possible and allow them to cool for around 15 minutes to mould to the shape of your feet. If none of these work, it’s time to invest in a new pair of boots. We all know that one player that turns up every week with his boots still caked in mud from last week’s match, or even worse, the one who’s boots stink of a mixture of sweat and cat pee. A pair of football boots can be a big investment so learning how to wash football boots is a skill that every player needs. First things first (and we’re looking at you parents here), it’s a rite of passage that every player should clean his or her own boots. 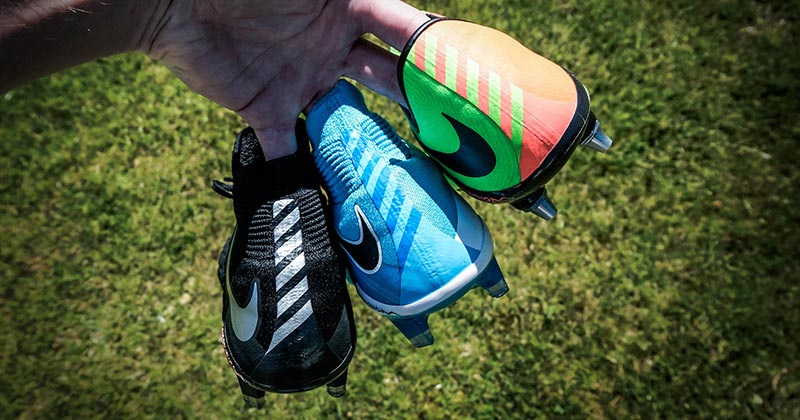 You don’t want your kid (or even worse teenager) to be the laughing stock of their team when they’re the only kid who still has their boots cleaned for them, so send them outside with the right tools from day one and leave them to it! A word of caution, do not wash football boots in the washing machine unless the care label explicitly states this is appropriate. They will degrade very quickly if you do and the seams could be ruined in one wash. You have been warned. Always clean boots outdoors, that dried on mud will spread far and wide otherwise! Give the boots a knock to remove the largest dried on mud and grass. Use the old toothbrush to remove any remaining bits of dried on mud or grass. Use the clean, damp cloth to wipe off the remaining dirt. If necessary, remove the laces and hand wash them with washing detergent or place in the washing machine. Sprinkle a teaspoon of bicarbonate of soda inside the boots to neutralize any sweaty smells and stuff them with newspaper to retain their shape. Dry the boots naturally, away from radiators which may crack the leather. Once they’re fully dry, treat with a leather restorer to extend the life of the leather. Again, take the boots outside and give them a knock to remove any large clods of mud or grass. Brush off the remaining mud using an old toothbrush to get in between any studs and seams. Wet the cloth and add a small amount of liquid washing detergent and wipe the boots down to completely clean off any remaining dirt. Remove the laces and wash separately if necessary. Add a teaspoon of bicarbonate of soda inside the boots to reduce offensive smells and stuff them with newspaper. There is no definitive answer to this question, it can be summarised by the phrase ‘it’s up to you’. 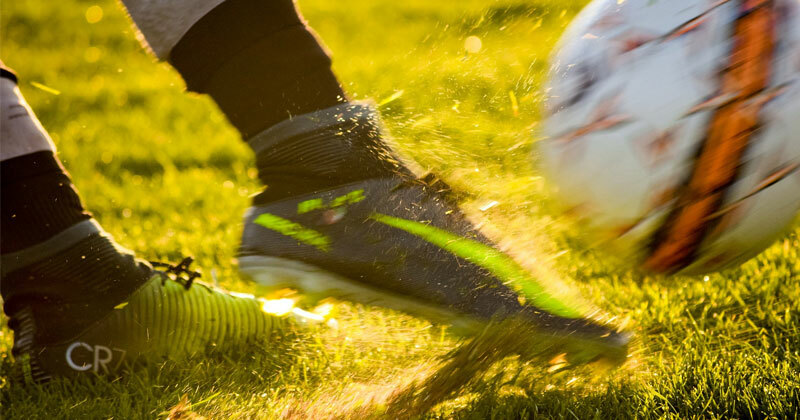 It’s well known that a tight football boot can improve touch and some players even buy a size smaller (Cristiano Ronaldo is rumoured to wear boots two sizes smaller than his feet) but there’s a fine line between a fitted boot and black toenails! Even if you like a tight boot, ensure you can at least fit your little finger into the back of the boot when it’s on your foot. Your toes shouldn’t touch the end of the boot. Boots always need a little wearing in and may nip on the first couple of wears, but if your boots are still painful or rubbing after a couple of week’s wear, they are too small. Try a variety of brands and styles of boots to find the right fit for you. 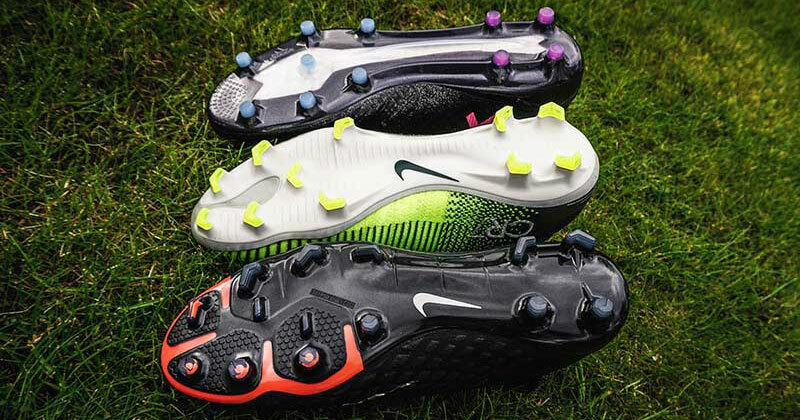 Players with wide feet should be particularly careful to find the right fit as many boots can come up narrow. Try on your boots indoors and in your football socks to ensure they fit correctly. Trying on boots in your work socks is guaranteed that you’ll end up with a too small pair. All boots and leather boots in particular will stretch over time so if the boot feels at all loose straight out of the box, it will definitely end up being too big. If all else fails and you’ve accidentally managed to buy football boots that are too small, take a look at our ‘how to stretch football boots’ advice above. 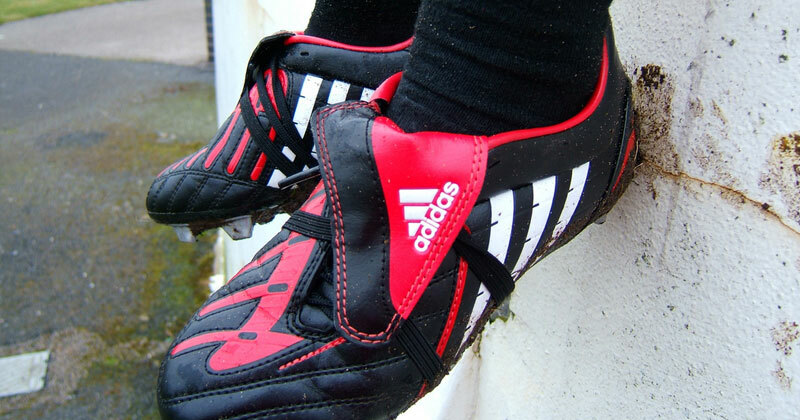 It’s happened to us all at some point, that terrible smell somewhere between cat pee and sweat, the dreaded stinking football boots. Our tips will help to prevent that from happening and also show you how to clean smelly football boots should they have already gone too far! Change the insole from the one supplied to an Odour Eater. Hang them open end down from the washing line on a cold windy day to allow the air to circulate inside them and dry them out. Add a teaspoon of bicarbonate of soda inside the sole after every wear. Remember to shake it out before the next wear. Add a drop or two of essential oil into the boots after every wear. Fill an old pair of tights with clean cat litter and secure. Place the bundle into the boots and leave for 24 hours. Spray the boots inside with a disinfectant spray (check it doesn’t contain bleach) and leave to dry overnight. Ensure clean, hot washed socks are worn every time. Air dry boots away from any unnatural source of heat. Don’t ever wash leather boots in the washing machine. Clean them properly after every use (see the leather boot cleaning guide above). Use a suitable boot leather food or cream to keep the leather supple and avoid cracking and drying. Do not leave the boots stored overnight in a sports bag, allow them to be properly aired in the open. Use a shoe tree inside the boots or stuff with newspaper between wears to maintain the boot shape. Drying your boots properly after every wear will extend their life, reduce cracking and stop them from smelling. It’s essential to understand and remember these simple steps to get the most from any football boots. Loosen the laces to maximise airflow throughout the boots and reduce the impact of the laces contracting as they dry. If the boots have a removable insole then remove it now and hang to dry. If you have access to fresh air, this is the best approach, do not hang on a radiator as the insole will contract and the material may separate from the insole. Clean up the boots by knocking the mud off, cleaning with an old toothbrush and then wiping down. Dry off the boots with a clean, dry cloth both inside and out to give yourself a head start on getting them dry. Gently roll up newspaper into balls and insert into the boot right down to the toe. It shouldn’t be tightly stuffed in and the balls should stay quite loose to allow them to absorb as much moisture as possible. Place the boots in an open dry space with access to fresh air if possible which should reduce smells forming as you’re drying the shoes. After around 3 hours of drying time, replace the newspaper with fresh balls. Once the boots are dry, replace the insoles and add some deodorising spray or bicarbonate of soda to freshen up the boots. Under no circumstances should you place boots in a tumble dryer, on a radiator, using a hair dryer or in an oven (!! ), this is guaranteed to ruin your football boots. A little patience goes a long way, it is worth investing time in the process. FOOTY.COM is your home for all the best football products. 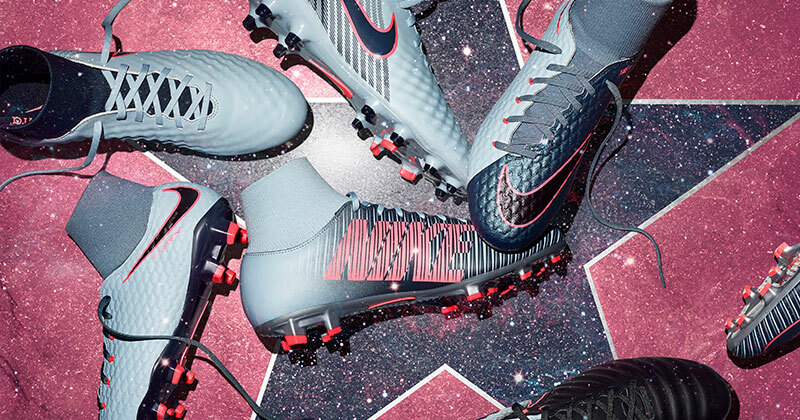 Whether you’re looking for a new pair of adidas or Nike football boots, we’ll show you the best prices to buy them for online. If you are looking for firm ground boots or boots with moulded studs, we have them all and compare prices to find you great deals. We show you the cheapest prices on soccer cleats and feature soccer reviews on everything from shirts to boots and every product in between. Join in the discussion about soccer cleat care and cleaning by following us on social media or commenting below.